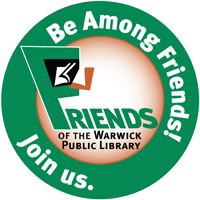 The Friends of the Warwick Public Library is a member-supported, nonprofit organization that assists the library in its work as an important educational, cultural, and recreation center in our community. The Friends sponsor concerts, storytimes, movies, museum passes, and summer reading and help with purchases and projects. The Friends raise funds through two, bi-annual book sales and through individual, family, and patron memberships, and we encourage you to join us as a member to help keep our library active and strong. Click here to pay online with Paypal. Download Friends' Membership Form Here if you wish to mail in your membership check. Trustee Board Room in Administration (2nd floor), at 5 p.m. The Fall Book Sale in 2019 will be held on September 20, 21, and 22. Find fantastic deals on over 6,000 hardcovers, paperbacks, children's books, CDs, and DVDs at the Friends of the Library Book Sale. The sale kicks off with the Book Sale Preview on September 20 from 5-8 p.m. The Preview is free to Friends-- if you are not a member you can join for $10 the night of the booksale. The proceeds support library programs and events, including museum passes, concerts, movies, and summer reading for children, teens, and adults. Donate your books and DVDs to the sale, too. Drop your tax-deductible donations off at the Maintenance Entrance on the side of the building.